West Berlin was an enclave that existed between 1949 and 1990. It comprised the Western section of Berlin, which was bordered by East Berlin and parts of the German Democratic Republic. The Western part of Berlin consisted of the American, British, and French occupation sectors, which had been established in 1945, and it was closely affiliated with the Federal Republic of Germany. East Berlin consisted of the areas occupied and administered by the Soviet Union, and the German Democratic Republic claimed it as its capital city. The Western Allies did not recognize this claim. They asserted that the entire city of Berlin was legally under four-power administration, and that it was not part of either the Federal Republic of Germany or the German Democratic Republic. Berlin remained under Allied administration, politically, until the German Re-unification of 1990. With about two million inhabitants, West Berlin had the highest population of any city in Germany. In 1948, the Soviets tried to force the Western Allies out of Berlin by imposing a land blockade on the Western sectors. 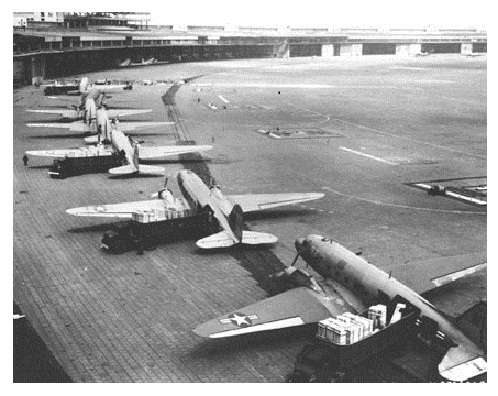 The West responded by using its air corridors for supplying their part of the city with food and other goods in the Berlin Airlift. 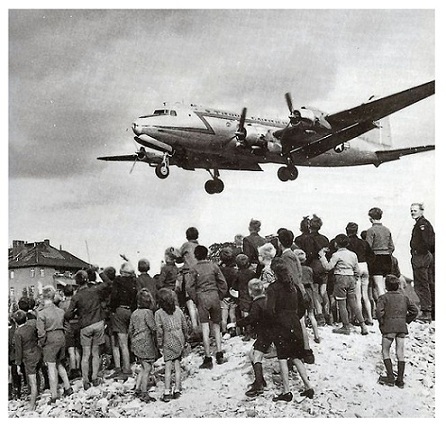 In May 1949, the Soviets lifted the blockade, and West Berlin was maintained as a separate city with its own jurisdiction. Another Soviet obstacle, the Berlin Wall, was a barrier constructed by the DDR, starting on August 13, 1961, that completely cut off West Berlin from surrounding East Germany and from East Berlin. The Soviet-dominated Eastern Bloc officially claimed that the wall was erected to protect its population from "fascist elements" conspiring to prevent the "will of the people" in building a Socialist State in East Germany. However, in practice, the Wall served to prevent the massive emigration and defection from the communist Eastern Bloc during the period following World War II. Along with the separate and much longer inner German border between East and West Germany, both borders came to symbolize the "Iron Curtain" between Western Europe and the Eastern Bloc. Following the destruction of the Berlin Wall in 1989 and the collapse of the German Democratic Republic in 1990, Berlin was again unified, and the city became the capital of the new nation of Germany. 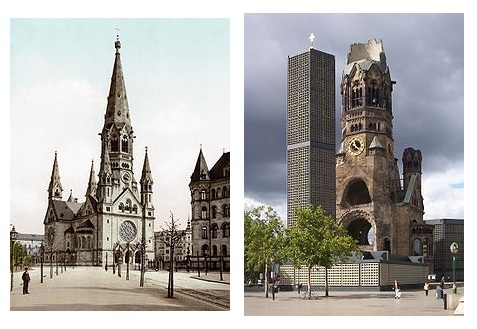 Construction of the Kaiser Wilhelm Memorial Church in Berlin was begun in March of 1891. On November 23, 1943, the church was irreparably damaged in an Allied air raid. The church was largely destroyed, but part of the spire and much of the entrance hall survived. The damaged spire of the old church has been retained, and it serves as a vivid reminder of the horrors of War. Its ground floor has been made into a memorial, and a new, modern church has since been built around its base. The early postage stamp issues of Western Berlin are highly sought after by collectors, and many of them have become very valuable. 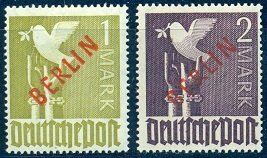 After about 1957, Berlin stamps closely mirrored the same stamp issues of the Federal Republic of Germany, with the only difference being the addition of the word "Berlin" to the legend on the postage stamps. Web page articles for West Berlin stamp issues will eventually be presented in the first link section below.